You might know this man's work - this lecture is on why the war is worth remembering. If you sre wondering if there is going to be anything to celebrate the 250th of this French victory then wonder no more - this article tells you what to expect in April. This is a photo of Great Northern Wars reenactors recreating a raid on a Swedish town in 1705 - I posted this is I thought that maybe you'd enjoy the image and ponder how similar the GNW is to the F&I in certain aspects. 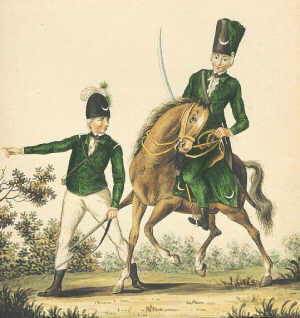 More on my Wars of Lous XIV blog. Oh how many times have I seen this sequence? OK I know there's a lot wrong with it - for a start if they're supposed to be a line regiment where's the lace? - and the drummer's mitres...white gaiters OK for parades like this but not in combat as later in the film - maybe it makes more sense to see them as Militia - but they turn up in Germany...but the flavour and the artistry are beyond criticism - capturing the excitement of seeing a military display in those times. Kubrick was originally set to make a movie about Napoleon but the Bondarchuk film Waterloo did badly and so Kubrick abandoned the project - the script is up online somewhere. Kubrick had threats from the IRA when shooting this movie - the German sequences were shot by a second unit - Kubrick began his habit of not leaving the British Isles. David Chandler who worked on this film later had access to all the uniforms and occasionally they were used by the Sealed Knot though not so much recently. Drums were made by Potter's. Someone who is celebrated in the West Country (where he started and ended his career) is this man. 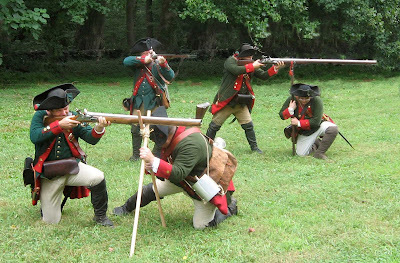 So it's not surprising to find a Devon-based reenactment society based on his Queen's Rangers - who are active in the area and attending Revwar events nationwide. Here is a link to an album of some great F&I figures - I'll let you work out the scale and so on. Also some Revolution images that I like too. I quite like the aesthetic of not painting the plastic figures - they often look better unpainted in my opinion. I've always found these small images at the bottom of a map of the Pontiac campaign interesting...have a look at them on full screen to see for yourself. 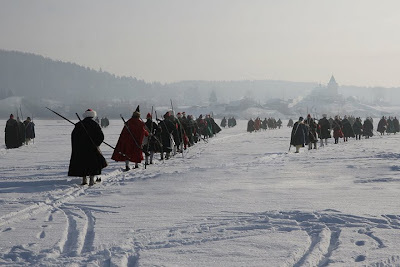 Interesting film of the morning ceremony at this 1812 event. 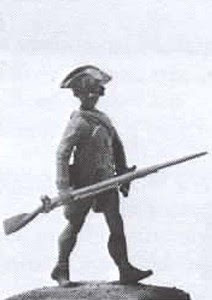 I like the look of these 1/32 metal kit figures for the American Revolution. As you may know I am a bit of a 1/32 scale fan so I was pleased to see this article on a wargame using figures of this size. Now of course with the Armies in Plastic range it's even easier. I haven't featured this Canadian movie much as it's a little early (around the time of Champlain) but just in case you haven't seen it here's a trailer - the music is wonderful - and the scenery and canoeing bits are worth the price of the DVD. While searching for Cooch's Bridge I found this site which is full of interesting photos and so forth. Of special interest was this photo of two Amusettes being used. Great footage including skirmishing from Light Infantry in this capture of the 230th anniversary reenactment. Cooch's Bridge was the only Revwar battle fought in Delaware. American naval hero - biography here. I actually had never heard of this fellow before but I was reading up about the Jersey Devil and apparently Decatur saw it while inspecting cannonballs and fired at it. The reason I was reading about the Jersey Devil was I was reading about a movie which has the origins of this creature as a Native American dedicating his 13th son to the Devil to fight the Americans in the Revolution. In the United States, the conflict was sometimes also referred to as the Franco-American War, the Undeclared War with France, the Undeclared Naval War, the Pirate Wars, or the Half-War. I am sure you who reenact all know about this forum but just in case you don't here's a link to get you started on searching the various threads. As far as I know it covers all aspects of the 18th century as it impacted America, from Native American topics to military. 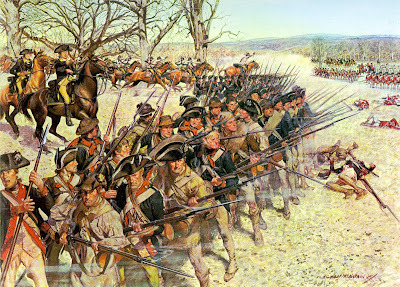 American Revolution: George Washington grants the Continental Army a holiday "as an act of solidarity with the Irish in their fight for independence". First celebrated in New York in 1756. This Quebec history videos are good - not sure which ones we have had so check out the others if you haven't seen any. This is one we haven't had. Today was the day this battle of the American Revolution was fought. Got these through the Mocassins wargames forum - they are photos of a lovely 15mm Seminole Wargames set up using mostly Freikorps 15 figures. Terrain looks the business. Occasionally I find obscure records that hail from the rock and roll era that kind of fit in with the theme of this blog but this is the first one I've posted - hope you enjoy this slice of Americana. I have not seen this movie starring Jeff Daniels as George Washington and covering the events that result in the battle of Trenton but this clip looks interesting. Interesting little film recommended by Thomsomfeld about the military fife. 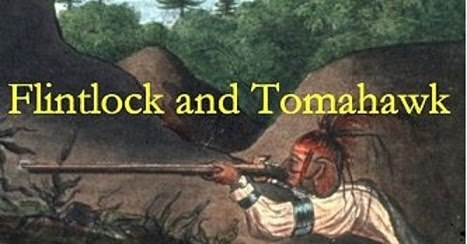 This battle was fought today - Caldwell's Rangers and Natives were involved so it definitely is worth reading about on the wiki article. If you want to get a Revolution era coat then this one from Jas Townsend looks good. Actually I remember Natassia Kinski in the Revolution movie looked pretty fetching in one and started a little fashion in the reenactment community for ladies to wear oversized military coats over their skirts and stuff. So here it is - now you can enjoy the movie in its entirety. Filmed mainly in King's Lynn and Exmoor this lost a lot of money when it came out. Prompted the famous criticism 'What Revolution was this?'. I think it was an influence on Mann's 'Mohicans' - particularly the Indian scenes which were shot in Wales I think. Quite a starry cast. Mohawks were a London street gang of the 18th century - I don't think they existed in New York. Funny how Pacino is the only one with an American accent. I remember reading a piece, that I don't have anymore sadly, by the historical advisor about how he just went to G Gedney Godwin and bought one of each thing and then traced the manufacturers of the various items - many from the UK and then got multiples. I expect G Gedney Godwin were chuffed. Reading the Imdb it seems this film is gradually picking up some good responses. Maybe its time has come. I remember when everyone slagged off 'Barry Lyndon' and then Kubrick died and it became a 5 star unmissable classic. This is my French Detachment for a game set during the French & Indian war 1756-1763. Models are a mix of Perry Miniatures and Conquest Miniatures. Rules used for gaming are called "This Very Ground" and are written by "Iron Ivan". Go here to see F&I reenactment photos from the last few years. Gallery of woodland indian reenactment images - looks like the Pontiac rebellion but I am not sure. I am looking forward to the 250th of 1763 - could throw up some interesting events and so on. This is a great historical blog that has much care and work gone into. Found by Thomsomfeld on his travels around the web. Pleasant film of a tabletop encounter in 28mm with the Sharp Practice rules.